Sometimes a girl just needs a good burger. To me, the Steakburger at the Apple Pan, with a pile of crisp, juicy iceberg lettuce thicker than the meat patty itself and a tangy tomato relish, is that quintessential Californian burger. 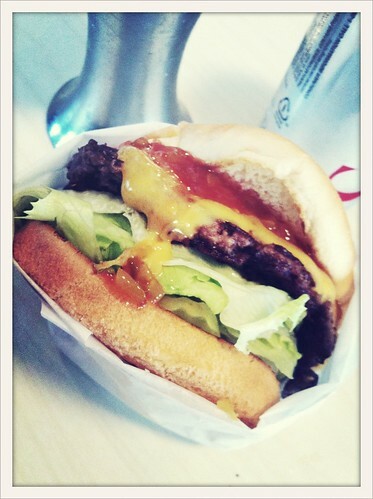 The bun was pleasant and soft, not overly buttered, and the patty had a nice beefy flavor. It's the more substantial version of the In-n-Out burger, with a gooey slice of natural Tillamook cheddar cheese instead of processed American cheese. With an old-fashioned cash register (in fact, this place only takes cash) and a U-shaped counter around the smokey kitchen, the entire place seems stuck in the 50's. However, it's happily stuck in the 50's. I actually found the ambiance of the place rather cute and quaint. The staff might appear to be old and grumpy, but in fact, were quite charming. 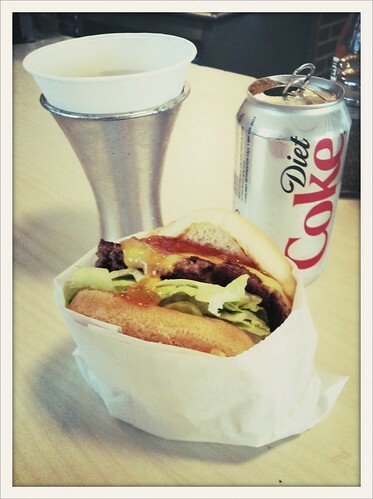 All I know is, as I was sitting there wolfing down my burger (sans plate) and drinking diet soda from a paper cone cup, I felt ridiculously content. Fortunately my mouth, and unfortunately for my waistline, The Apple Pan is on the way to and from my ceramics studio. There's no doubt that this is only the first of multiple visits. I see a hickory burger and slice of pecan pie in my near future. How did Apple Pan's burger compare to others on the west side? I've seen it so many times going to Westside Pavilion, but havent tried it. I really like it. It's a very no-fuss burger. Very straight forward, yet not lacking in flavor even though not dressed up in fancy arugula or Niman Ranch bacon etc. i've had an apple pie there, but never a burger. is that sadness or what? 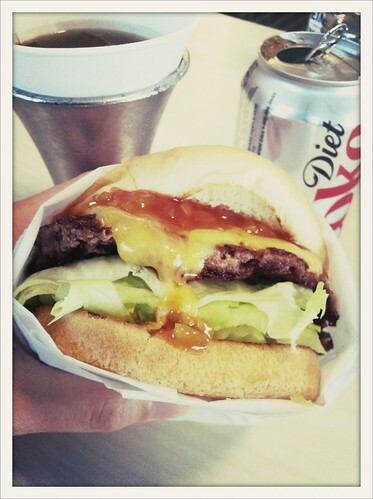 @bagnatic: it's okay...I've had the burger, but I haven't had any of their pies!